We had a nice rain tonight. Our rain gauge shows that we had more than a half inch. Our garden still has tomatoes, cabbage, green peppers and hot peppers left in it. 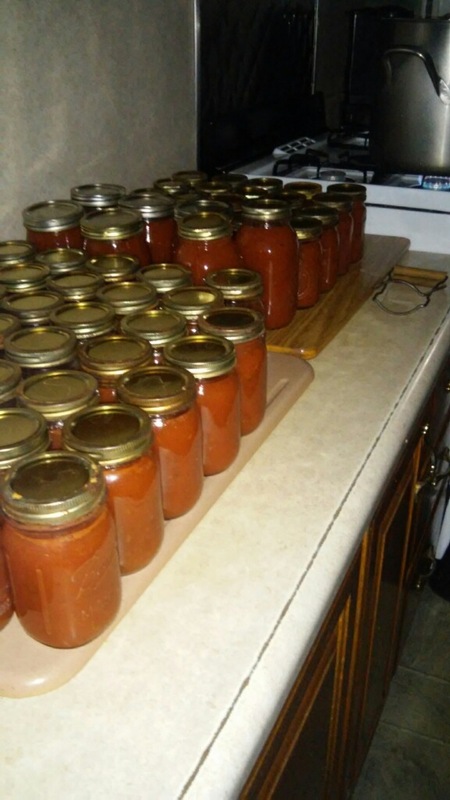 Yesterday we canned almost eighty pints of pizza sauce. We gave twenty pints to Mose and Susan. We also canned hot peppers. Susan wants to make pizza casserole tomorrow night to try out the sauce. 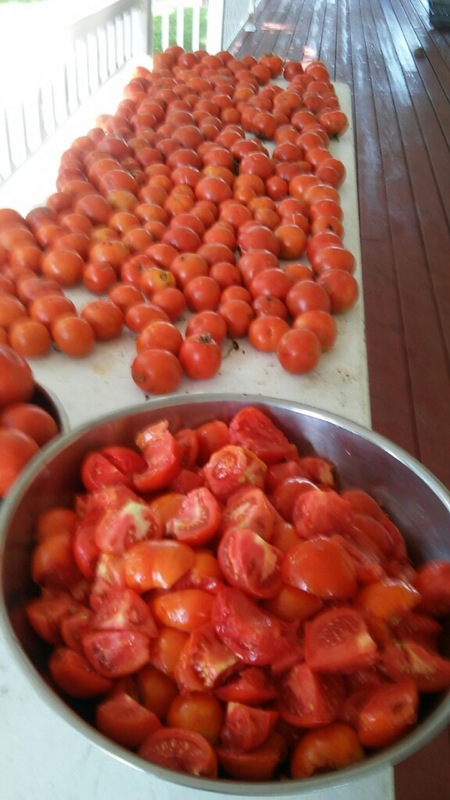 As summer winds down, the Eicher family has been busy picking tomatoes from their family garden. Mose and Susan are getting more settled as the weeks pass by. They have been helping Mose’s parents, as they are hosting the wedding for Mose’s brother Joe and his fiancée, Mary, next week. 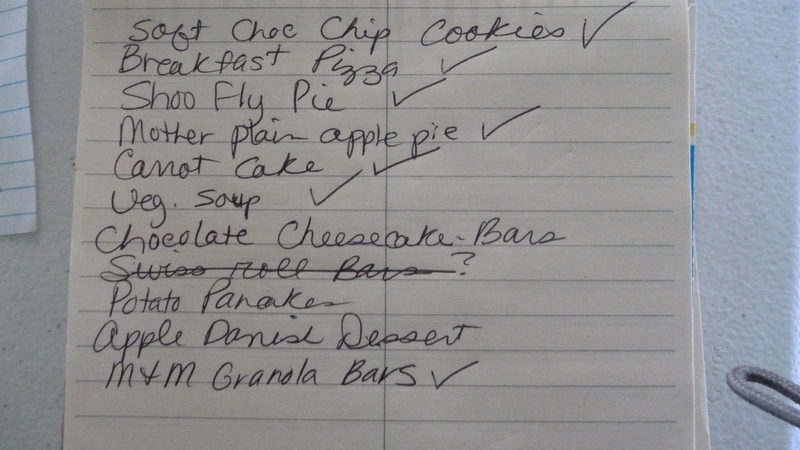 I was asked to be cook at the wedding and to go help bake pies, etc., the day before. Mose and Susan will be table waiters at the wedding. Susan still needs to cut out and sew her dress for the wedding. With her working every day, I will probably have to help her get it sewn. Saturday Joe and I and the six children here at home attended the picnic for the RV factory where Joe works. It was interesting to tour all the RVs and motorhomes that they make. We were served a good meal, and lots of door prizes and awards were given to the many, many employees. The grand prize was a Howard Miller grandfather clock. It rained and rained after lunch, but they had plenty of tents set up for everyone to stay dry. A very happy birthday goes to sister Verena. She turned fifty on August 22. Mose, Susan and most of the children went over to sing “Happy Birthday” to Verena that evening. Tomorrow morning I leave with daughter Susan for a town around 45 minutes away. Susan needs to get her married name put on her Social Security card, and she wants me to go along. 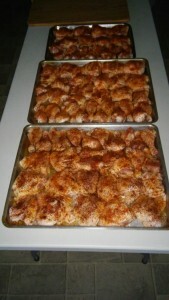 Tonight Mose grilled banana pepper poppers and I made chicken noodle soup. We still don’t have all the water lines hooked up to Mose and Susan’s living quarters, so it’s easier for her to use my kitchen. Most often they just eat the evening meal with us. The boys and Mose are often spending their free time having bow practice. Mose has a big target set up, so it’s an easy place to test out their skills. Hunting season will be here before we know it. The boys passed their hunters’ safety class earlier this year. Saturday evening Timothy and Elizabeth came for supper. After supper Timothy, Mose, Loretta’s special friend, Dustin, and son Joseph practiced shooting their bows. The girls and I just relaxed and visited. Joe has been working longer hours, so he’s always glad to rest and get to bed earlier. 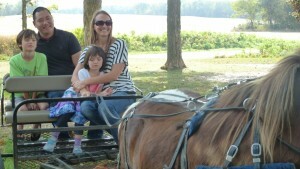 Daughter Verena and son Benjamin, with some other young folks, drove to northern Indiana with horses and buggies. They spent the night at niece Susan and Joe’s house. The next morning they drove to brother Albert’s. Church services were held at Albert’s home. Their daughter Emma was baptized at the service. Sunday afternoon Verena and Benjamin started the journey home. They had around twenty miles to go to get to niece Susan’s house, and around seventeen miles to get home from Albert’s house. Our horse Mighty handles these long trips really well. They do take their time, and let Mighty walk a lot of the time. School doors will be opening in less than two weeks. Our school starts September 6. All three children will be in middle school. Joseph will be in eighth grade, with this being his final year of schooling. Where does time go? Lovina will be in sixth grade and Kevin in fifth. Kevin will be eleven next week. It seems like he was just born, and now he’s already turning eleven! The Eichers canned pizza sauce using tomatoes from their garden. 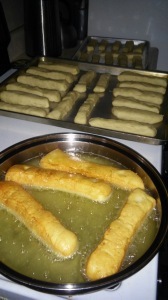 This is a recipe for breadsticks niece Elizabeth shared in our family cookbook. Our children like to dip them in pizza sauce. Heat the milk, sugar, salt and 4 tablespoons butter; remove from heat as soon as butter is melted. Add the flour, yeast, garlic powder, oregano and beaten egg. Let rise until double. Roll out and cut the size you want. 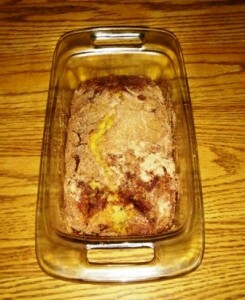 Melt the remaining 4 tablespoons butter in a pan, and sprinkle pizza seasoning over it; roll breadsticks in this mixture. Place breadsticks on cookie sheets and let rise again until double. 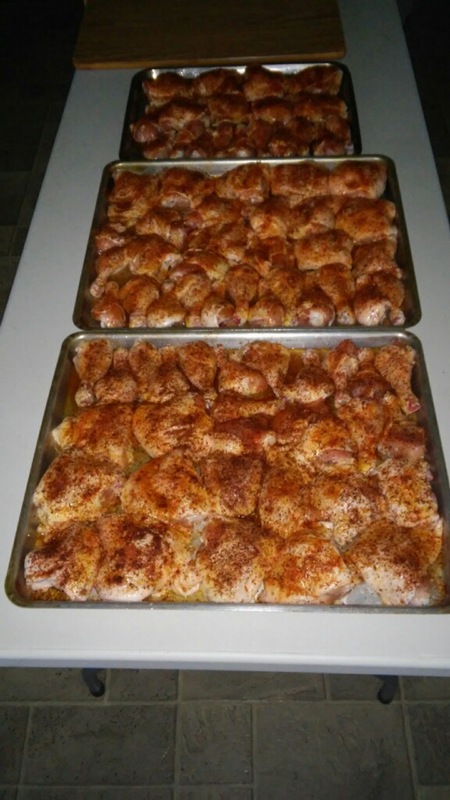 Bake at 350 degrees for 15–20 minutes or until done. Breadsticks can be dipped in pizza sauce or cheese sauce when eating. Yield depends on the size of the breadsticks. Editor’s Note: Lovina Eicher took a vacation while her children were on spring break. Guest columnist is Melodie Davis, one of the editors at MennoMedia/Herald Press which syndicates Lovina’s column. I walked into Lovina’s kitchen on a beautiful October morning last fall to a hive of women cooking up a storm. A breakfast casserole was in the oven and some cookies were already cooling—and the coffee was on. 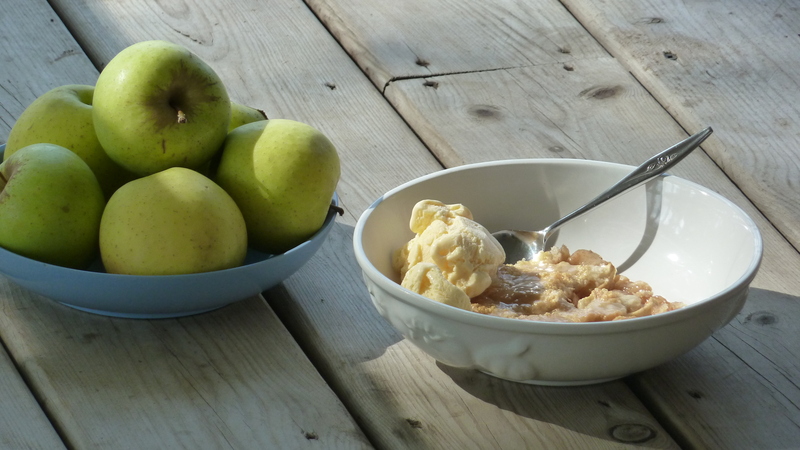 Two huge bushels of apples sat over at the edge of the kitchen. Lovina, plus her daughters Verena and Loretta, were busy mixing and stirring. 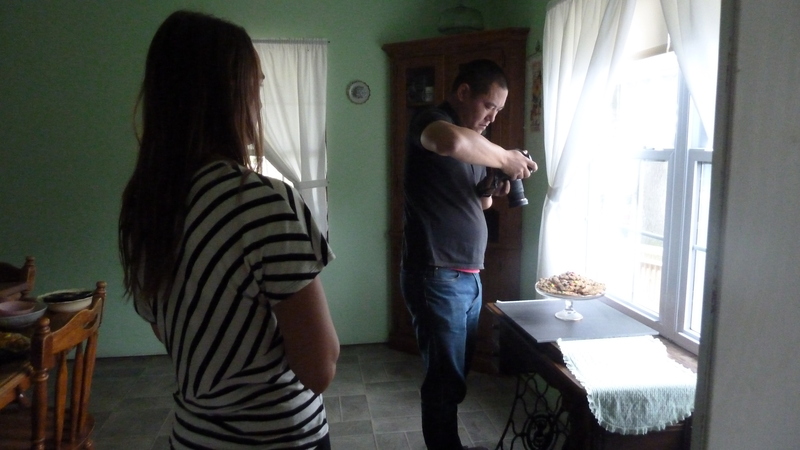 A man by the name of Lucas Landis was taking pictures as the Eichers worked—all without actually photographing faces or even backs. Most of us understand that Amish generally do not pose for any photographs as part of their faith and custom, aiming for simplicity in life and spirit (avoiding pride and boasting). What was the kitchen hum about that morning? If you haven’t guessed it yet, Lovina is producing an Amish-themed cookbook, the first one of her own in about four years. We at Herald Press are thrilled! It will be all her own recipes (aside from some, of course, sent by readers or obtained from friends and relatives—Lovina has more cousins than we can count) but each recipe will be tested and adapted by Lovina and her “English” friend Ruth Boss, plus a clutch of volunteer cooks from Ruth’s church. I was pleased to also meet Ruth that morning, who arrived a bit later and had stopped at a nearby Amish bakery to buy sweet rolls, long johns and other delicacies for the work day. Ruth quipped, “They’ll have to carry us out of here,” because she knew just how plentiful and delicious the food would be that day. You may recall Ruth writing a guest column for Lovina late last summer on daughter Elizabeth’s wedding so Lovina could catch her breath. Some of the dishes Lovina and daughters made that day included Shoo Fly Pie, Apple Pie, Apple Danish, Carrot Cake, M & M Cookies, Potato Pancakes, Vegetable Soup and more. She had scheduled three such “cooking days” last fall—in addition to everything else that Lovina does in a normal busy week. 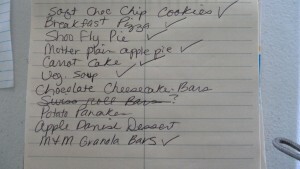 Lovina’s handwritten cooking list with items completed checked off. Let me add that I was utterly amazed at how well and how much Lovina’s teenage daughters helped—they were in the kitchen all day cooking various recipes—all under Lovina’s watchful instruction. When they weren’t cooking, they were constantly washing dishes. Which is where Ruth and I jumped in—rinsing and drying the dishes, pans, and utensils! I put my hands in that steamy hot water and it felt like home—the wonderful hot water I love for cleaning dishes. The name of Lovina’s new cookbook is The Essential Amish Kitchen: Everyday Recipes from Farm and Pantry. A cookbook takes extra-long to “cook up” so it comes out in April 2017. 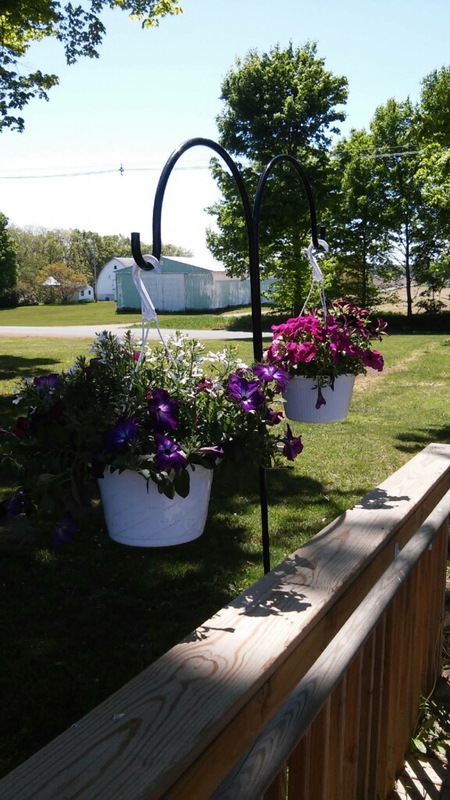 We hope you’ll want one to use whenever you want a taste of good home cooking from farm and pantry! The book will be sold online and at bookstores everywhere. Lovina’s column, along with her blog and Facebook page, will keep you posted on when it’s available for preorder. 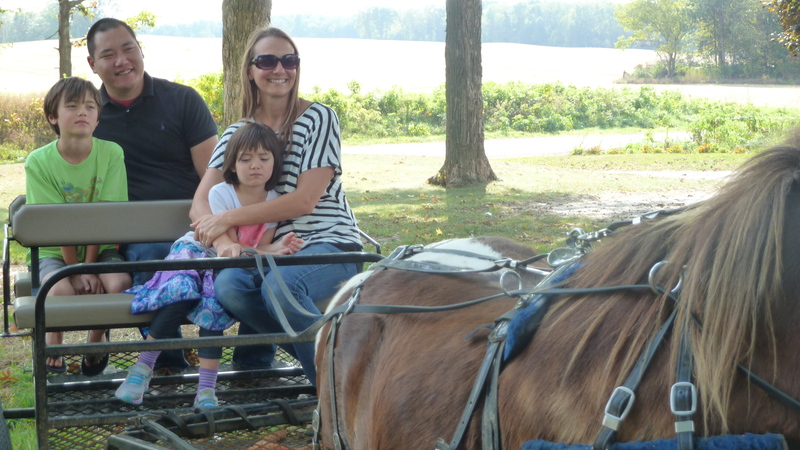 The Eicher children wanted to take the cookbook photographer and his family for a quick wagon ride at day’s end. I’ll share one of my own favorite recipes, adapted from another classic Mennonite cookbook, More-with-Less Cookbook, for Oatmeal Bread. Combine above ingredients in a large bowl. Pour 2 cups boiling water over mixture, stirring to combine. When batter is cooled to lukewarm, add the yeast mixture. Stir in 5½ cups white flour (you’ll probably add another ½ cup in kneading). 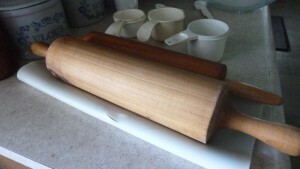 When dough is stiff, turn onto a floured board and knead 5–10 minutes. Place in greased bowl, cover, and let rise until doubled. Punch down and let rise again. Shape into 2 loaves and place in greased 9x5x3-inch pans. Bake at 350 degrees for 25–30 minutes. Cool on rack. 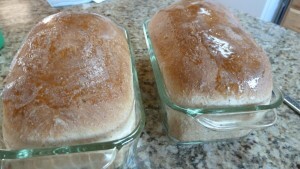 Brush loaves with butter or margarine for a soft crust. Melodie Davis is a writer/editor for MennoMedia and Herald Press who also writes her own syndicated newspaper column, Another Way, and keeps a personal blog Finding Harmony Blog. The Christmas holidays and family get-togethers are now over for another year. Yesterday, January 6, was Old Christmas (Epiphany) so everyone was home for the day. It was a day well spent with family. I had a baked meal with the menu consisting of meat loaf, scalloped potatoes, baked beans, lettuce salad, cheese, dill pickles, hot peppers, applesauce, sugar cookies, and zucchini bread. Daughter Elizabeth and Timothy joined us for part of the day. Of course their dogs Crystal and Izzy came along. The dogs are always so excited to come here and the children are equally happy to see them. In the afternoon we played the game Life on the Farm. It is always a fun game even though it can last for several hours like Monopoly. The players have to buy cows but can lose them again. The first player that owns 60 cows and has $10,000 wins the game. Always an exciting game to play. Kevin, 10, and Lovina, 11, had fun playing also. Other games played were Aggravation, Connect Four, and Checkers. On New Year’s Day we went to Jacob and Emma’s house for a haystack brunch. They had the tables set for all of us. Sisters Verena and Susan, Elizabeth and Timothy, and all the girls’ special friends were there as well. Besides haystacks there were all kinds of desserts but no one was hungry after the haystack meal. We enjoyed snacks and desserts later in the day. After dishes were washed we exchanged gifts. Nephew Steven had my name and gave me a 32 x 55 inch cutting mat to cut out clothes. I have a small one but am really going to like this bigger one. Daughter Lovina had my husband Joe’s name and gave him an ice auger to drill holes in the ice when he goes ice fishing. This year so far it looks like he won’t get to use it. I’m sure we will get colder weather yet. Son Joseph was given an ice fishing pole by son-in-law Timothy so he is also hoping for ice fishing weather. After the gifts were all opened we played games. A new game I played was Apples to Apples. Jacob and Emma had the final inspection of the addition to their house approved. Their children have moved their clothes up to their new bedrooms. They were excited after living in a ranch style one-story house. We all ate the haystack brunch in the new attached garage. They still have some remodeling to do as they want to tear out the bedroom walls and make a bigger kitchen, dining room, and living room. I am sure they will be glad when it’s all done. Church services are set here for January 17, so we have been kept busy cleaning. Sister Emma, her son Jacob, and her daughter Emma came on Tuesday to assist us in cleaning. We cleaned most of the basement and washed clothes. Saturday we will have more help so hopefully everything will get cleaned in time. We are heating our new building where we will host church services (where Tim and Elizabeth’s wedding and church were held this summer). I hope all of you had an enjoyable and safe holiday and may God bless you all in 2016 and always! 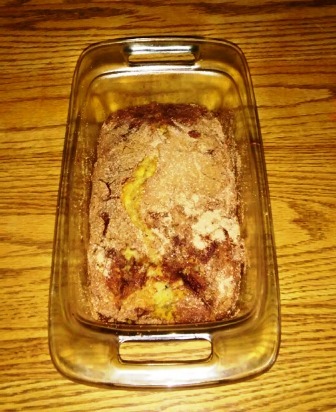 I’ll share my sister Susan’s cinnamon bread recipe. She brought this bread to Jacob and Emma’s on New Year’s Day. 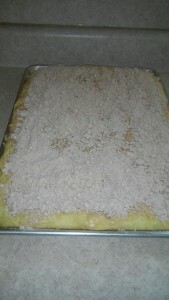 On a lightly floured surface, roll thawed bread dough into a 10×12 inch rectangle. With a pastry brush, paint the dough with the water, and then sprinkle the sugar and cinnamon evenly over dough. Top with raisins if desired. Roll up jellyroll-fashion beginning on the 12-inch side. 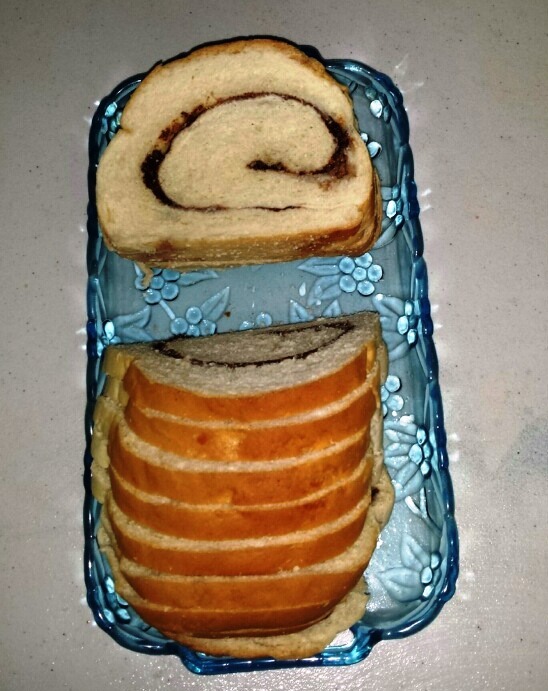 Seal all seams and ends and place in a greased 8×4 inch loaf pan. Let the dough rise until double in size. Bake at 350 degrees for 30 minutes. Remove from pan to cool. When cool, brush with melted butter. Who will be the donkey? 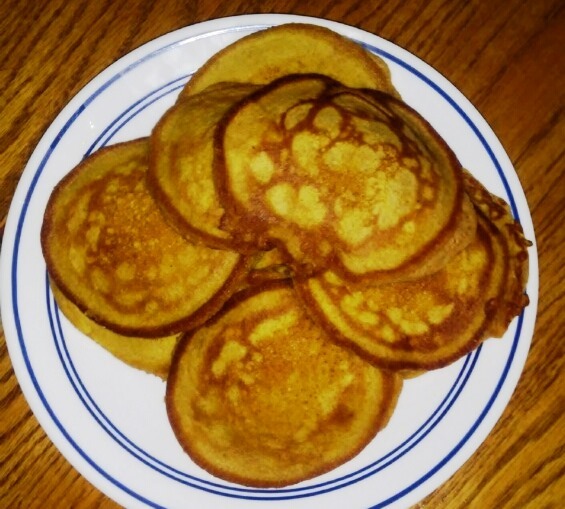 Fun game for your holiday season plus pumpkin pancakes! We were excited to wake up Saturday morning with a layer of snow on the ground. It snowed most of the day on Saturday and I think we received around seven inches of snow. The hunters were glad for the snow too. The snow clung to the tree branches and made such pretty scenery. Only God can paint the earth with such beautiful scenes. The children enjoyed sled rides on Saturday evening. We are officially in the summer months now. We have had a few cool nights, with the temperature in the 50s by morning. Sure makes for good sleeping after some hot evenings with temperature in the 80s. Actually, this morning we had to close most of our windows. The thermometer showed 54 degrees. Not really normal June temperatures. 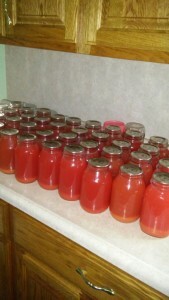 Yesterday we canned 45 quarts of rhubarb juice from 30 pounds of rhubarb. 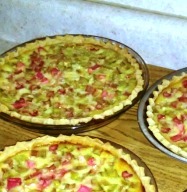 Our friend Barb and my sisters Verena and Susan gave us the rhubarb. I have rhubarb plants, but never enough to make a year’s supply of rhubarb juice. I think the children have already emptied two gallons of it! Rhubarb juice is a good thirst-quencher on hot days. The Eicher family canned 45 quarts of rhubarb juice one day last week. Joseph, 12, and Kevin, 9, were tilling and weeding the garden, so they wanted rhubarb juice when they took a break. Joseph is a good gardener and seems to take an interest in caring for the garden. Verena, 17, keeps my flowers watered, and they are looking very healthy. If it is left to me to water them, they usually die of thirst. I can make things grow in the garden, but flowers seem to not do well for me. I love flowers, so I am glad someone has taken over the duty to care for them! My husband, Joe, brought in our first hot peppers from the garden tonight. Our tomato plants are loaded with tomatoes, and everything else looks like it is doing great. We are all done with work for the evening. I’m sitting out here on the porch writing this. It’s a very cool and peaceful evening. Oh, the many blessings God gives us. We have so much to be thankful for, and so often we take it for granted. Let us remember to thank our wonderful God daily for all our blessings. This column was pushed off until this evening, but I feel like we accomplished a lot today. The girls are cleaning their closets and getting ready to start some major cleaning in the upstairs bedrooms. Elizabeth is gradually packing the things she won’t need for now. She will move them over to Timothy’s house for after their wedding. It gives me a sad feeling, but I don’t want to take the joy away from her. I remember the exciting time of preparing for my wedding to Joe. With God’s help, I will get used to my firstborn leaving home to start her life with her husband. I’m sure a lot of parents have dealt with this feeling. I think I will call it a night. I was up until midnight last night, waiting until the last of the rhubarb juice was cold-packed. Our neighbor has hooked our water over to solar power. It had previously run by a propane motor. From now on, the sun will power our water! It seems different to not hear the motor kick in when the water pressure gets low. Since the water was shut off due to the switch, I had a late start canning the juice, so that’s why it was so late until I was done. 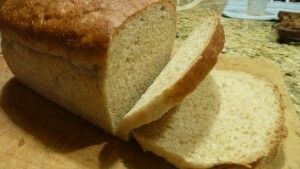 A reader shared this recipe for green tomato bread with me. She said her family likes this bread better than zucchini bread. She grates her green tomatoes in the fall and puts them in the freezer to make this in the winter months. Mix sugar, oil, eggs and vanilla together. Add flour, cinnamon, salt, baking soda and baking powder. Mix well, and then add nuts and tomatoes. Pour into two greased loaf pans. Bake at 350° for 50 minutes or until done. Spring will officially be here this week as I write this! Monday was a very beautiful day with the temperature going up in the 60s. We hung all the laundry outside to dry. It was so nice to be able to fold all the clothes and put them away the same day. Susan’s friend Mose tapped all our maple trees for sap and also some of the trees at my sisters Verena and Susan’s place. He also tapped a few of neighbor Irene’s trees. The sap is running but not as much as some years. Mose cooked the sap on Saturday and we now have fresh maple syrup. It is surprising how many gallons of sap it takes to get one gallon of maple syrup. A lot of work goes into it all. Family friend Mose boils off some authentic maple syrup from the Eicher farm. We all love the maple syrup. It tastes so much better on pancakes than pancake syrup. The children like to warm it and put it on vanilla ice cream. 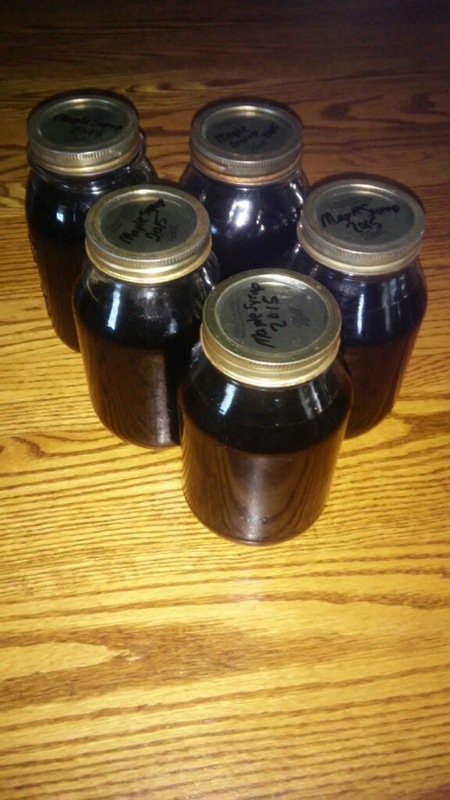 Five quarts of home canned real maple syrup taste way better than the store kind. We had a nice day for Alvin and Susanna’s wedding last week. The wind was a little chilly but the sun was shining so that helped. On the menu were mashed potatoes, gravy, baked chicken, dressing, mixed vegetables, lettuce salad, sliced cheese, homemade bread, butter and strawberry jam, angel food cake with a strawberry topping, mixed fruit, and pecan, blueberry and cherry pies. Ice cream was also added for the evening meal. We wish Alvin and Susanna a long, happy married life together with all of God’s richest blessings! We have several more wedding invitations for this spring. 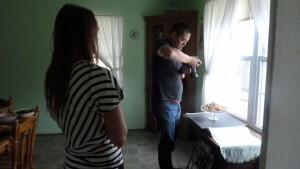 Joe’s cousin Ben and Elizabeth will exchange vows on April 3 in Rochester, Ind. They both lost their first partners. We wish them a happy, blessed life together! Also, congratulations to Orlie Wayne and LaVera Ann! They will exchange vows on April 23. Joe and Orlie work at the same RV factory. We appreciate the invitations and hope to be able to attend. We also received a “Save the Date” and an “invitation-to-follow” card from cousin Jane’s daughter Tiffany and her fiancé Samual. They plan to exchange vows on Sept. 5. Congratulations to the couple! Our thoughts are with niece Suzanne, age 14 (sister Liz and Levi’s daughter). She has been in the hospital since Monday. She has asthmatic bronchitis pneumonia and a virus. We hope she will be well enough to go home soon and have a speedy recovery. It’s always a worry for the parents when our children are sick. Sounds like she was dehydrated with a high fever and was a very sick girl. Sunday we had dinner with sisters Verena and Susan. Another beautiful day! The children enjoyed playing outside, biking, and riding the pony. Timothy and Mose also were there and sister Emma, Jacob, and family. Also their daughters’ friends, Menno and Manuel. Daughters Verena and Loretta spent the weekend in Indiana with friends so they weren’t there. Joe and the boys took advantage of the nice weather on Saturday and hauled some manure out of the barn. I love spring! It’s always nice to see everything start blooming. I am keeping my eye open for those dandelion greens. Rhubarb stems should be peeping through too. This morning we had 23 degrees so we might have a few cold days yet. 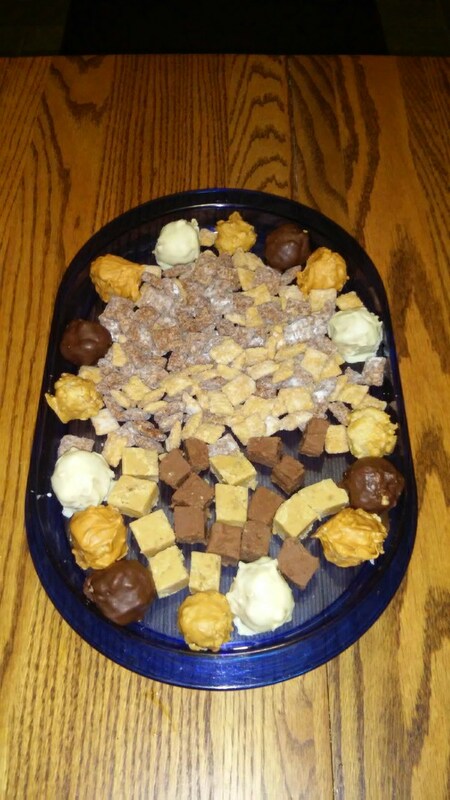 A lady from our church shared this recipe with me. I bought the raised doughnut mix and cinnamon doughnut sugar at a bulk food store. I’m not sure if other stores would have it as well. Our children love these and it’s easier to make than doughnuts. Enjoy! God Bless! Lovina’s recipe of the week is for an easy raised-type donut pastry, Rise and Roll Bars. Mix together yeast, sugar and warm water. Then add raised doughnut mix. Let rise 30–45 minutes. Knead and spread in a buttered 10 x 15 cookie sheet and let rise again for 30–45 minutes. Bake at 350° for 15–20 minutes. Cook together brown sugar and butter for 2–3 minutes. Add milk and bring to a boil. Take off heat and cool to lukewarm. Add powdered sugar. Spread bars with frosting then sprinkle with cinnamon doughnut sugar before the frosting dries. This is the final day of 2014 as I write. A brand new year awaits us. May God be our guide as we travel into the unknown future. Sister Emma, Jacob and family, and sisters Verena and Susan and all the girls’ special friends plan to be here for supper tonight. We will then play games such as Aggravation, Mancala, Connect Four, checkers, and various other games to keep 24 people entertained until midnight. The children enjoy staying awake to see the new year arrive. Joe and I would much rather get some extra sleep, but it’s fun to see the excitement. Everyone will sleep here and we will have brunch together tomorrow. We will set up beds and air mattresses in the basement for the boys and the rest will sleep upstairs or on the couches. The number of people has grown from last year. We add tables to our big dining room table, making enough room to set it up for 24. We will have a gift exchange too. Saturday evening the youth in our church district went Christmas caroling to the older people in the church and neighborhood. Instead of having to deal with snow, it was rain. 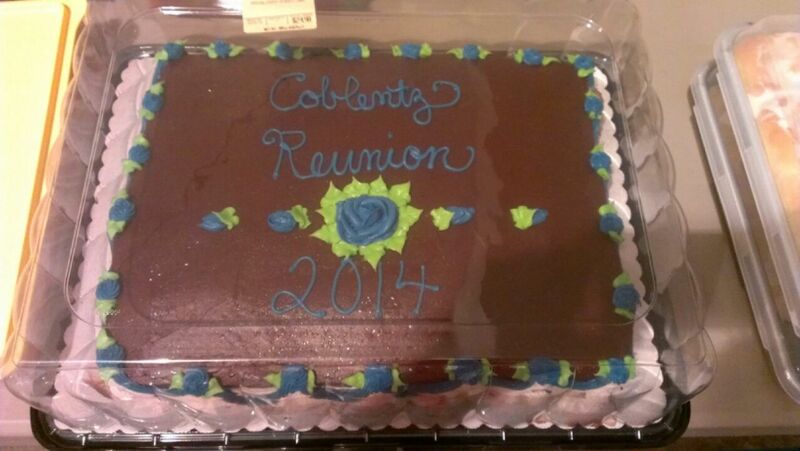 It wasn’t too bad until they were all back at our neighbor’s. The 30 youth all gathered here earlier in the month to exchange names and play games. How blessed we can be to have such a well-behaved group. Everyone brought snacks and we had hot dog sandwiches. Saturday evening they all took snacks to enjoy after caroling. The girls were happy with the gifts they received. Timothy brought us a deer one evening. It was a big doe and had a lot of meat. Joe wants to make summer sausage and jerky with it. Yesterday Mose sent a 5-gallon bucket full of deer meat from a doe he shot yesterday morning. We are so thankful for the meat. We all love jerky so the children are hoping Joe gets some made before going back to work. On Sunday our church had its annual Christmas potluck. There was so much food. Pasta casseroles, potato casseroles, ham and cheese sandwiches, a variety of salads, pies, cakes, bars, cookies, puddings, etc. There was more than enough food. We still don’t have snow. We have a few flurries now and then. It’s so different than last year. Yesterday morning the mercury on the thermometer dipped down to a cold 12 degrees for a while. Son Benjamin, 15, left for work around 5:30 a.m. Then around 6 a.m., Joe, son Joseph, 12, and I traveled the eight miles to town to get some groceries. The ride was nice and cozy with the heater going in the buggy. How spoiled we feel since we used to travel in an open buggy when we lived in Indiana. When we made the move to Michigan almost 11 years ago I needed time to adjust to driving in a covered buggy. Now I would have a hard time getting used to driving in an open buggy—especially in the rain and cold winter months. 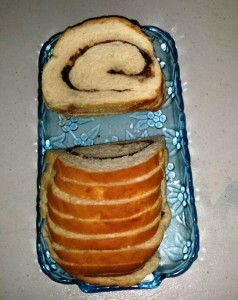 I made cinnamon rolls and Long John rolls over the Christmas holiday. I’ll share the recipe for Long John rolls. Pour the water into a small bowl, and then add the yeast and stir until completely dissolved. Set aside. Scald the milk and let cool to lukewarm. Add the milk to the dissolved yeast. Blend together eggs, butter or margarine, sugar, salt, and nutmeg until well blended, and then add to the milk and yeast mixture. Gradually add flour until the dough is elastic and easy to handle. Knead until you form a round ball. Put in a bowl and cover with wax paper. Put it in a warm place and let rise until doubled in size, about 2 hours. Punch down and divide the dough into 2 large pieces. Roll out each piece to a 3/4-inch thickness. Cut into 7-inch oblong pieces. Let rise again. 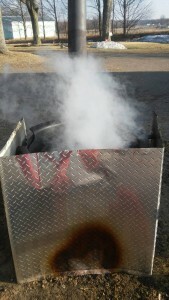 Heat vegetable shortening in a deep pan to a depth of 2 to 3 inches until very hot. 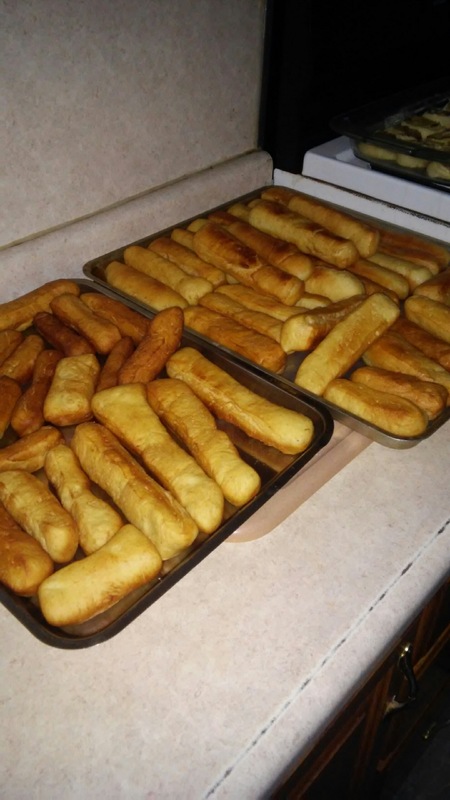 Fry the rolls in batches until golden, 2 minutes on each side. 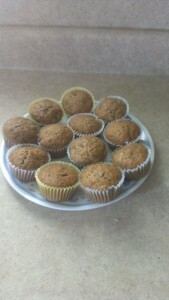 Frosting may be added if desired, once the rolls have cooled. Long John rolls cannot be frozen or stored; they should be eaten the day they are made.